During this short meditation, we get into the sensations of the breath and the ease it can provide. The breath is a timeless tool for meditation in all lineages. I love focusing on the breath because it's always available and there are many ways to incorporate it into a meditation, as you may have noticed during the recording. Breath can truly be a powerful and healing agent for stress and reactionary emotions. Breath is commonly referred to as: a life force, purifier of toxic energy, a de-stressor (or a source of anxiety), it is how our organs receive oxygen and is an agent to help find pauses in time or pauses before reactions. It is symbolic in its power as the giver of life from the first breath in as a newborn to the final expiration at the end of life. As Georg Feuerstein says “it makes sense to want our every breath to count and [awareness of it can make] this possible”. I hope that we can all take time today and every day to pause, relax and observe the breath. Sitting in meditation isn't necessary to practice this awareness but it's the route to going deeper into breath and the self. Go slow and be easy on yourself. Take a deep breath, enjoy how it feels to release tension with a cleansing exhale and settle into the present moment. 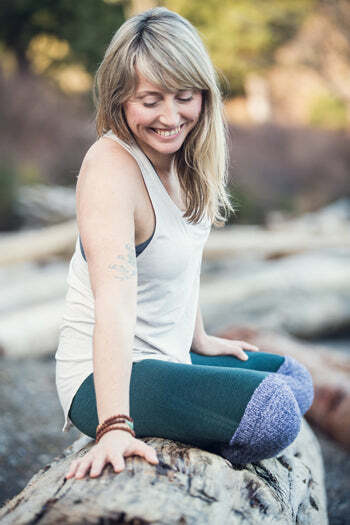 Carolyn Anne Budgell(BA, ERYT since 2008) is an introspective and lighthearted yoga/meditation instructor in Vancouver, BC. Carolyn discovered yoga in 1999 as a ski bum in Whistler and now teaches all over with Lila Vinyasa School of Yoga, Calm Rebel Meditation Community, lululemon, various international yoga festivals / conferences and many other organizations. She passionately encourages others to discover that it’s never too late to breathe deeply, to grow and to change. Check out her events at www.carolynannebudgell.com.